Tibetan Spaniels, commonly called Tibbies, originated in, well, Tibet. 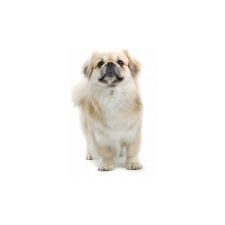 Like the Tibetan Terrier, who isn’t a terrier, the Tibetan Spaniel isn’t a true spaniel either. Most likely the Japanese Chin, the Pekingese, and the Pug had a share in the development of this breed. Often called Lion Dogs, these alert, sturdy dogs would sit on walls of Tibetan monasteries and bark when strangers approached. They are extremely agile (read good climbers) and are often compared to cats. In the cool regions of Tibet, monks carried these dogs in their robes for warmth, both for themselves and for the dogs. Medical missionaries brought the first of these dogs to England in the 1920s where they gained in popularity over the years. The first on the North American Continent were brought to Canada. Tibetan Spaniels are made for companionship. They become closely attached to their owners and display a great eagerness to please. They are protective and playful and good with children and other pets, but tend to be reserved with strangers. As with all breeds, care should be taken when children and dogs are together. Tibbies are good alert dogs, as they are not particularly yappy, but will still bark when strangers approach. They can live anywhere so long as they are not left alone for long periods of time. They are athletic and sturdy and require regular amounts of exercise. Tibbies can be stubborn and they certainly have a mind of their own. They can be a bit difficult to train because of this independence. If they get bored, they are likely to eat your shoes! They are, however, quick to learn what they want to learn. For the most part, you can forget about your Tibby coming when you call, unless it fits in with his plans anyway. You will need an enclosed outdoor area or a good leash if you want him to stay close by. Your Tibby will be about 12-15 pounds when full grown, square set and sturdy. Tibbies come in a variety of colors, with or without white markings on the face, chest, underbelly, and paws. His coat has a long fringe on the legs and tail, and the tail curls up over his back. He has silky ears that at times take on the appearance of having been crimped, with ripples down over the ear. Eyes should be brown and the nose is black. He does shed a fair amount of hair, so you are likely to find hair stuck to just about everything. Once or twice a week brushing will help remove much of the loose hair. It was commonly believed that Tibetan Spaniels brought good luck. They were reputed to have been used by the monks in Tibetan monasteries to turn the prayer wheels, in addition to serving as alarms. They have an uncanny knack for sensing mood, and some experts recommend that you not fight in front of your Tibby, as they are likely to become quite upset. The Tibby is an independent thinker who has been known to open doors - and purses for that matter.